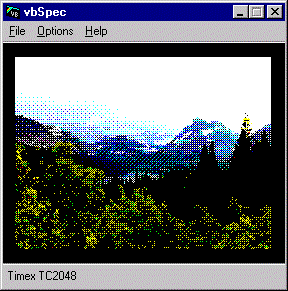 A hi-resolution (512x192 pixel) 2 colour display which is great for adventure games and text based programs as it can easily support 85 column text or, at a push, even 128 column text. 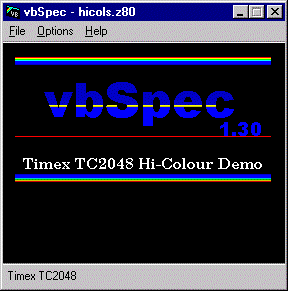 A hi-colour display. This display mode goes a long way towards removing the irritating colour-clash that was the scourge of so many Spectrum games. In this mode, a 6144 byte attribute area is used in place of the standard Spectrum 768 byte one. This eliminates all colour clash in the vertical plane without having to resort to CPU-intensive tricks. If only the original UK Spectrums had this display mode! Description: Slideshow of 5 hi-colour scanned images. Descrpition: Small demonstration of some colour-bar effects using the TC2048 hi-colour display mode.